– You see, this man-lion strategy problem hasn’t got a fixed point. – For example, let’s say we all want to go to the Big Buddha tonight. But you and Alex will only go if Raph and I come along. While Raph and I will only go if you and Alex don’t come. – Well, that’s a bit harsh. – Same with the lion and the man. – Do you want to go to the Big Buddha tonight? The Big Buddha is a Thai restaurant on the first floor of a building which also accommodates the Ugly Duckling, serving Chinese food, on the ground floor. From the outside there was no other obvious entrance apart from the one leading into the Chinese restaurant. We walked into the (empty) ground floor and found out that the two actually operate together, and we could have either of the menus or mix and match. Uh-oh. I suppose there is nothing really wrong with a restaurant serving both Chinese and Thai food, but it seemed like a marriage of convenience. Although the initial plan was for Thai, I got a craving for dumplings and then decided to stick with Chinese for my main too. I shared a starter of them with Alex, who insisted in having them fried rather than steamed. 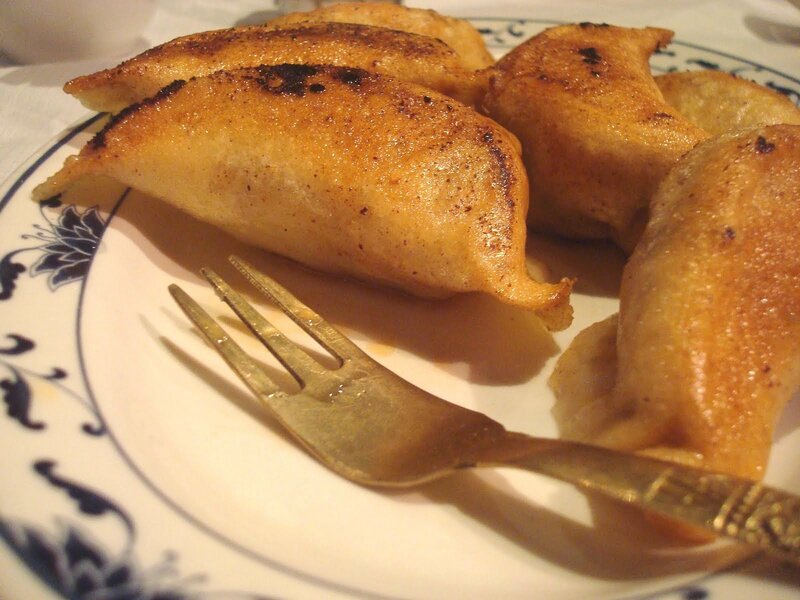 Fried is okay, but I just love the sticky, silky dough you get from a steamed dumpling. Turns out, they were steamed and then pan-fried. The perfect compromise. The porky filling and the accompanying sauce were lovely too. 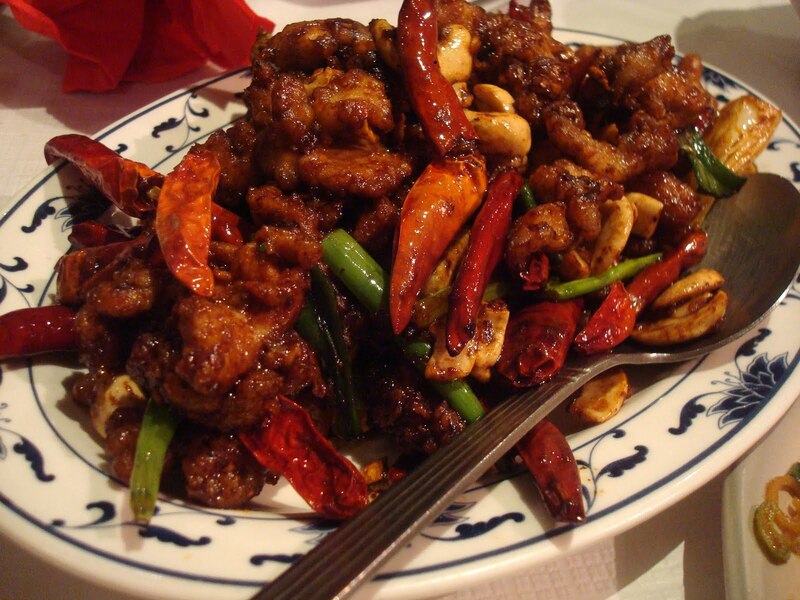 The Szechuan pork I had for my main was crispy and meaty and spicy. It looked great and tasted lovely. I’m not a big fan of cashews but Phil polished them off for me and we all had a little (or big!) taste of the chillies. They were quite flavoursome and not as painful as our waiter had suggested when he begged me not to eat them! I actually preferred the Double Cooked Pork that Alex had. 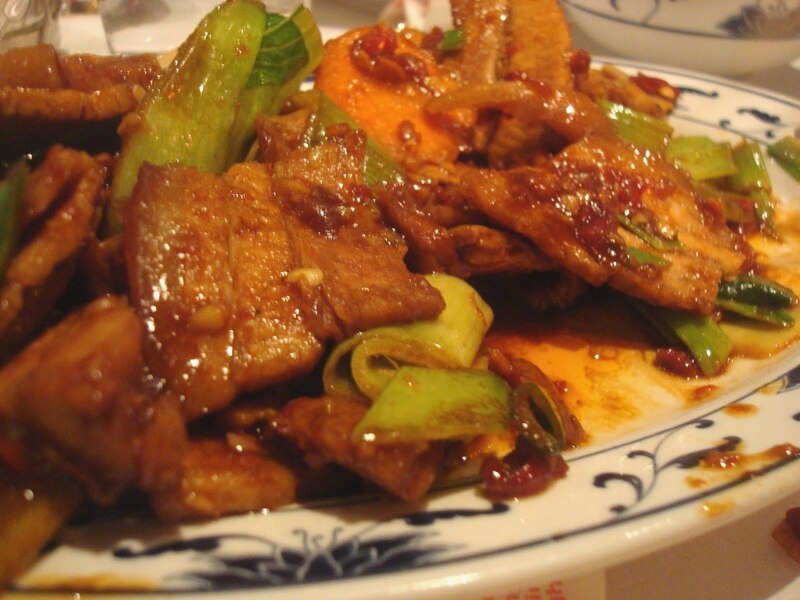 The meat was soft, with a nice amount of fat on it and the sauce was sticky and spicy. 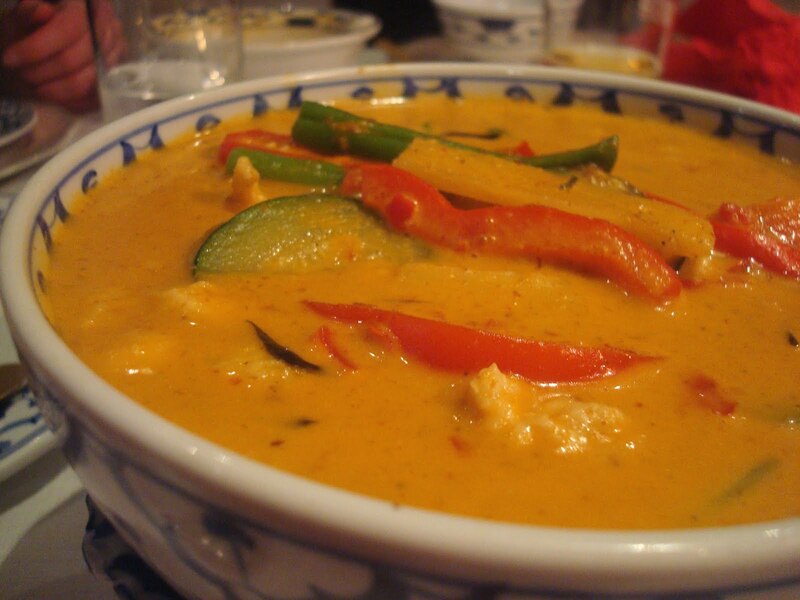 Finally, I sampled a Thai curry that Phil and Raf were sharing which had a great kick to it! I think I would have found it a bit too much actually if I was eating the whole thing but the little taster I had was perfect: strong flavours and creamy texture. This meal actually left me looking forward to my Chinese and Thai months of cooking and really managed to save the first impressions that weren’t too positive. At £20 pounds for half a (large) starter, a main and a beer, it’s not exactly cheap but not too bad either.